The executive cooncil biggin burns efter bein hit bi artillery fire in Sarajevo Mey 1992; Ratko Mladić wi Airmy o Republika Srpska officers; a Norse UN soldier in Sarajevo. Internal parteetion o Bosnie an Herzegovinae accordin tae the Dayton Accords. Ower 38,200 ceevilian casualties, mainly frae the Bosnian Muslim ethnic group. First case o genocide in Europe syne Warld War II. Deployment o NATO-led forces tae owersee the peace agreement. Establishment o the Office o the Heich Representative tae owersee the ceevilian implementation o the peace agreement. a Frae 1992 tae 1994, the Republic o Bosnie an Herzegovinae wisna supportit bi the majority o Bosnie Croats an Serbs (wha each haed thair ain hostile entities). Consequently, it representit mainly the Bosniak (Bosnie Muslim) ethnic group in Bosnie an Herzegovinae itsel. The post-war Bosnie an Herzegovinae encompasses aw three Bosnie ethnic groups. b Atween 1994 an 1995, the Republic o Bosnie an Herzegovinae wis supportit bi, an representit, baith ethnic Bosniaks an Bosnie Croats. This wis primarily acause o the Washington Agreement. The Bosnie War wis an internaitional airmed conflict that teuk place in Bosnie an Herzegovinae atween 1992 an 1995. ↑ 3.0 3.1 3.2 3.3 3.4 Calic, Marie–Janine (2012). "Ethnic Cleansing and War Crimes, 1991–1995". In Ingrao, Charles W.; Emmert, Thomas A. Confronting the Yugoslav Controversies: A Scholars' Initiative. West Lafayette, IN: Purdue University Press. pp. 139–140. ISBN 978-1-55753-617-4. Footnotes in source identify numbers as June 2012. ↑ 4.0 4.1 4.2 4.3 4.4 "Spolna i nacionalna struktura žrtava i ljudski gubitci vojnih formacija (1991–1996)". Prometej. Christia, Fotini (2012). Alliance Formation in Civil Wars. Cambridge University Press. Retrieved 13 April 2013. Finlan, Alastair (2004). 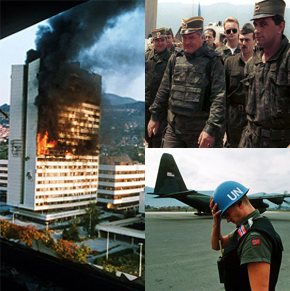 The Collapse of Yugoslavia 1991–1999. Osprey Publishing. Retrieved 16 February 2013. Mulaj, Klejda (2008). Politics of Ethnic Cleansing: Nation-State Building and Provision of In/Security in Twentieth-Century Balkans. Lexington Books. Retrieved 4 May 2013. Ramet, Sabrina P. (2010). Central and Southeast European Politics Since 1989. Cambridge University Press. Retrieved 16 February 2013. This page wis last eeditit on 20 September 2016, at 17:36.